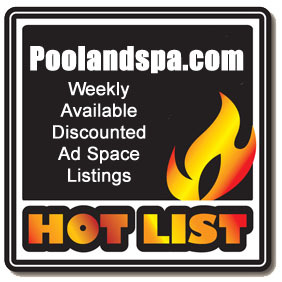 Want to Advertise on Poolandspa.com at a BIG Discount ? From time to time we have leftover ad space available on our web site due to either companies changing their plans, changing ad agencies, reorganizing, or going out of business altogether. Well, their loss can be your gain ! We are offering their unused, available ad space at a tremendous discount to selected companies. See our current available ad space below. Choose the advertising program that is best for your company and simply fill out the form below to get started. Hurray - space is limited and these deals will go F-A-S-T ! Space is sold on a first come, first served basis. All the prices below are heavily discounted. We would rather have someone use the space than let it go to waste. The prices listed below are your one time total cost for the period of time listed in the "Details Of Package" column. No additional charges will be incurred for these discounted plans. Yes, the prices are unbelievably low, but from time to time, there are bargains out there ! Who will see my ads ? Who will see your ads ? Take a look at the complete Poolandspa.com Demographics and Traffic Reports. We have TENS OF THOUSANDS of pool and spa owners and buyers on our site every week. These are the perfect target demographic for many pool and spa related companies, as well as other high-end retailers looking to hit a high-end demographic. Also see all our other Advertising Packages. How long will it be before my ads start to appear on the site ? Normal ad account set-ups takes approximately 7-10 days from the time you place your order. Depending on the number of other work orders placed, there are times when your ads may show up in as few as 3-4 days. Order online right now by using the form below. Any of the Discount Packages above must be paid using a credit or debit card only - NO billing allowed. You must provide a credit card. No discount packages can be held unless they are paid in full when this order is submitted. Orders submitted without a valid credit card will immediately go back up for sale again. I would like Poolandspa.com to make my ads for me. Use the ads Poolandspa.com has on file for me. You will receive an email confirmation of your order, normally within 48 hours. © Copyright 1994-2012 by Poolandspa.com Inc. All rights reserved. No part of this electronic publication and it's contents may be reproduced, electronically or otherwise, nor distributed in any manner without the prior expressed written consent of Poolandspa.com Inc. Any Copyright infringement will be prosecuted to the fullest extent of the law. Web Site Created by Master Image. Web site dedication.